Sometimes a girl just wants a salad. A big salad. After eating approximately 47 cookies during the month of December, I decided we needed to lighten things up this week. 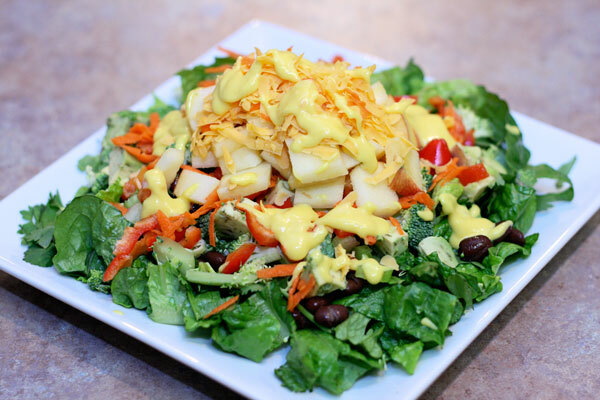 This big salad is piled high with avocado, apples, black beans, broccoli, carrots, celery, red peppers, and cheddar cheese. All topped with my favorite honey mustard dressing. If you like your honey mustard dressing to be simple, thick, and sweet, then this recipe is for you. Whisk together all ingredients and add to your big salad. What you made, exactly, is one of mine. I remember having that many times as a kid. Believe it or not, I’ve never had this! Sounds like a deviled egg dressing.